It’s been well over a year since opening the kiln last and I was surprised to find work waiting to be fired. Two mugs, a canister that was supposed to be a tea pot, trials of some printmaking techniques and a few crazy sea squirt creations. Back in the winter of 2009, I had the opportunity to take a workshop from Ginger Steele when my mom was ill. Ginger specializes in beautifully stamped thrown and hand-built wares. Many of her pieces grace our cupboards and counter top. I was hoping the workshop would help push me back into the world of ceramics but it was not to be. However, I did create two mugs and the canister/teapot. Life happens. My mom died in 2010, cancer diagnosis with my dad (plus 7 broken vertebrae), my own illness and that year was pretty much a waste. Fortunately art projects helped with the healing process. 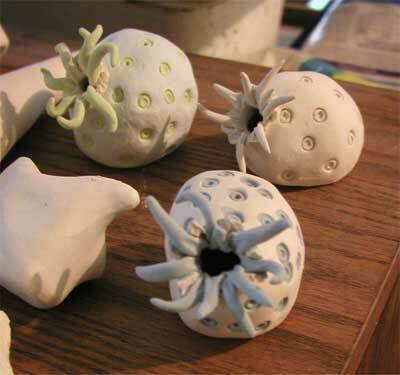 The sea squirts, as I recall, were pretty fun to make. Maybe more to come depending on how the firing goes. 26 bowls are now loaded and cooking as I type this entry. 5 colors total for the interior: deep yellow, maroon, avocado, cinnamon & electric blue. At some point tomorrow I’ll be able to pop open the lid and see the results. Tracie will be receiving her bowls on schedule! My family & Dave’s will have to wait. Dave scheduled an Austin trip starting Christmas day. I get to stay home with the evil dogs & work on pottery. Oregon & the Pacific Northwest are loaded with potters of all types. Finding a niche in the field seems difficult, but artists do it all the time. Do I want to find a place in the ceramic world? The jury is still out. I’m just trying to figure out where I fit with art in general. I keep getting pulled in so many directions depending on what I need/want to say. A good friend loaned me his kick wheel many years ago. If he ever wants to reclaim it, I would happily give it back. Especially if it helped get him back into ceramics! Sean, I’m talking to you man! I really like the sea squirts! Thanks for the sharing. Thanks! Looks like you create some pretty cool puzzles. Nice to see your site! You will never know your full potential if you try to “fit in” to this vast art world. I personally love to see that someone has done so much work they have developed their signature style. Its all in the details. How neat to discover forgotten (or half-forgotten) creations. I think they are like a window to a past state of mind. Wish we had windows like that for the future. How fun to find treasures in your kiln! 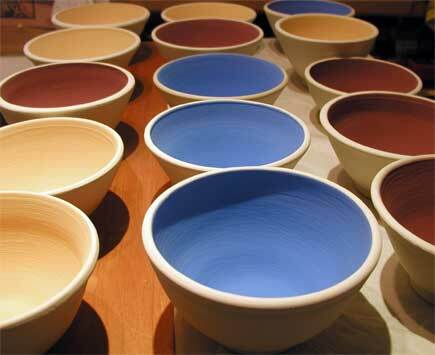 I can’t wait to see what the glazes in the bowls come out like. After watching Dylan’s progression in ceramics, I find the evenness of your bowls remarkable. Have a wonderful Christmas!!!! Hey Maria! So glad you chimed in. I would really love to see all of Dylan’s creations, from clay to wood. What an amazing young man! Maybe your household needs a wheel & kiln for Christmas? You might like it too! 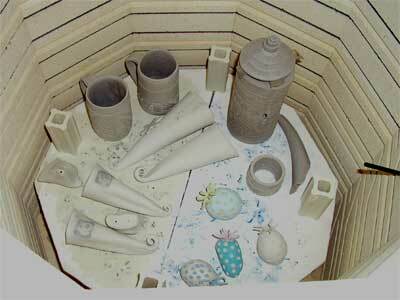 Firing the kiln is like Christmas Eve when you were little & couldn’t wait to open presents. Temp is up above 1200 and climbing! I’ll keep you in mind when they start migrating out of the house! Wonderful! Simply speechless my friend!